Kim stepped briefly away from The Top Ten: Writers Pick Their Favorite Books to talk about some of her favorite series of books. I thought I should talk about something along those lines, but I’m not a huge series fan. I’ve read a few here and there, but I’m not hugely fond of them. Maybe the kind of things that need to be done for a series compromise the book level view a bit, at least as far as what I’m looking for, it’s hard to say. I have been at least somewhat fond of one or two, but perhaps not enough for a post. There was one that interested me quite a bit, but for perhaps different reasons than one might expect. As such, we’ll go ahead and talk about the Micro Adventure series, despite the fact that I only ever read one of the books. This was an 80’s Scholastic series written in second person where you were supposed to get involved with the action by typing in a Basic program (designed for Apple, which translation tips for other systems, since there were so many versions of the Basic programming language at the time), figuring out how it worked, and “hacking it” to get it to do what you needed (i.e., change the program to kill the robots instead of the humans). The idea was to teach programming a bit, and along the way have a space-age action adventure. I only ever actually read Micro Adventure No. 6 Robot Race by David Anthony Kraft. Found it in one of the Scholastics and picked it up. I was fascinated, despite never getting around to typing any of the programs into a computer and “hacking” them as instructed (my parents rarely would hook up our Commodore Vic 20 for me). A half-human/half-computer evil named Brutus was leading a robot army against the world. You were a computer wiz teaming up with ACT (the Adventure Connection Team) to stop him. Seriously, it was cheesy, the programs were pretty simple to modify (though some were interesting), and there wasn’t a huge amount to it. Still…it was fun. I would totally have bought the others in the series if I’d ever seen any in the subsequent Scholastic. I never did though, the above being the only one I ever checked out. Still, it was enough of a pull that I went looking for a copy to get again twenty years later. I have it even now, sitting right next to me as I write this. This entry was posted in Uncategorized and tagged act, basic, basic programming language, micro adventure, micro adventure no. 6 robot race, Micro Adventure No. 6 Robot Race by David Anthony Kraft, Micro Adventure No. 6 Robot Race David Anthony Kraft, Micro Adventure No. 6 Robot Race Kraft, micro adventure robot race, micro adventure series, no. 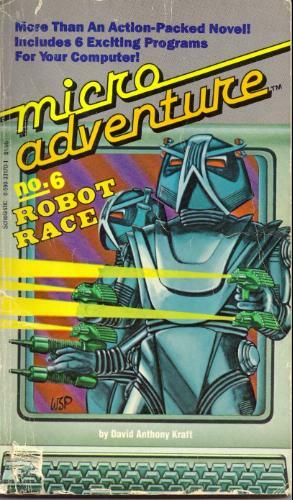 6 robot race, robot race, scholastic, the Adventure Connection Team. Bookmark the permalink.